It’s Protection That’s Just Right. Current events often highlight the vulnerability of your vital CPUs and servers. When stolen, it’s not the computer they want… It’s the information. Mission-critical computers need protection from unauthorized data access, vandalism, accidental damage, and theft. News reports provide the frequent reminder that a primary target of thieves and disgruntled employees is your data. 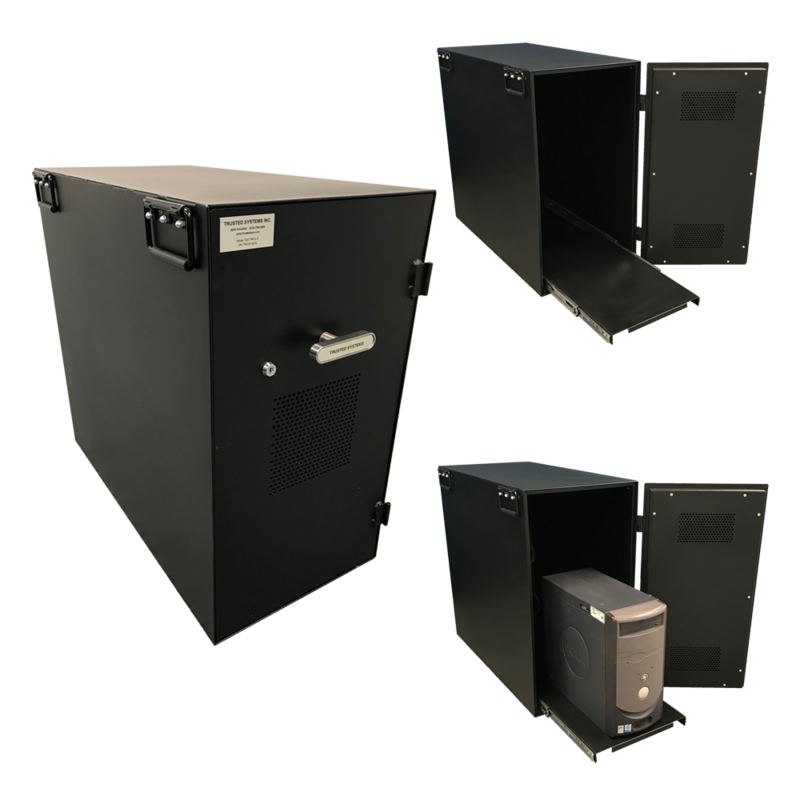 Whether it’s a threat from an unauthorized insider who’s hell-bent on copying data through a USB port, or an outsider’s scheme for a smash-n-grab, a Trusted Systems’ Secure Computer Cabinet is protection you can trust. 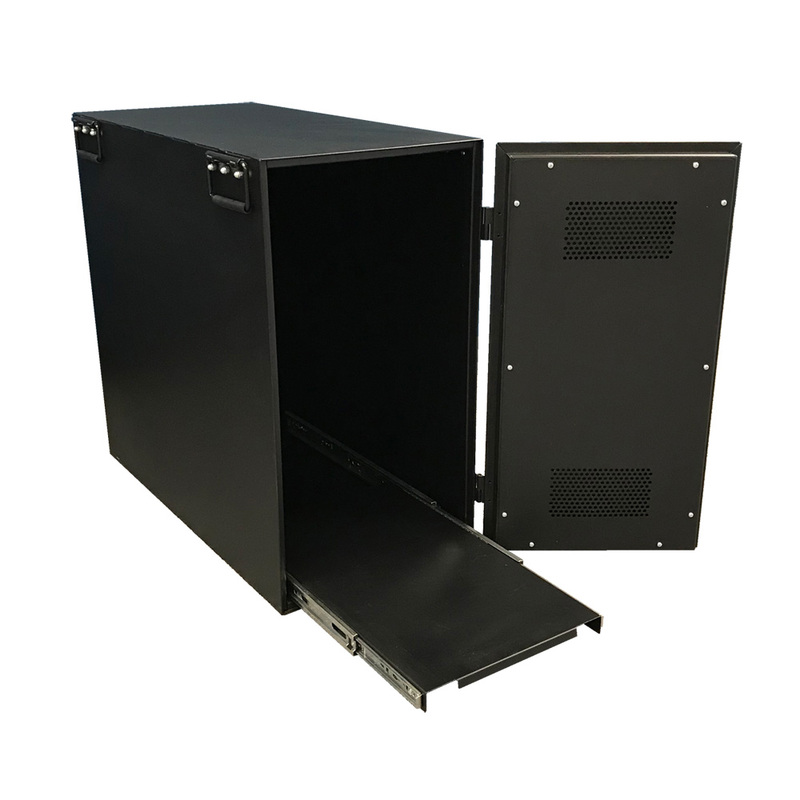 The feature-rich design of a Secure Computer Cabinet includes precision-welded, 16-gauge steel construction enclosed by a high-security, cam-lock door system, all coated with a dual-purpose, textured powder coat to provide a tamper-evident finish while enhancing heat dissipation. The stature of this imposing computer enclosure announces a formidable barrier to internal surreptitious actors, as well as, professional thieves. 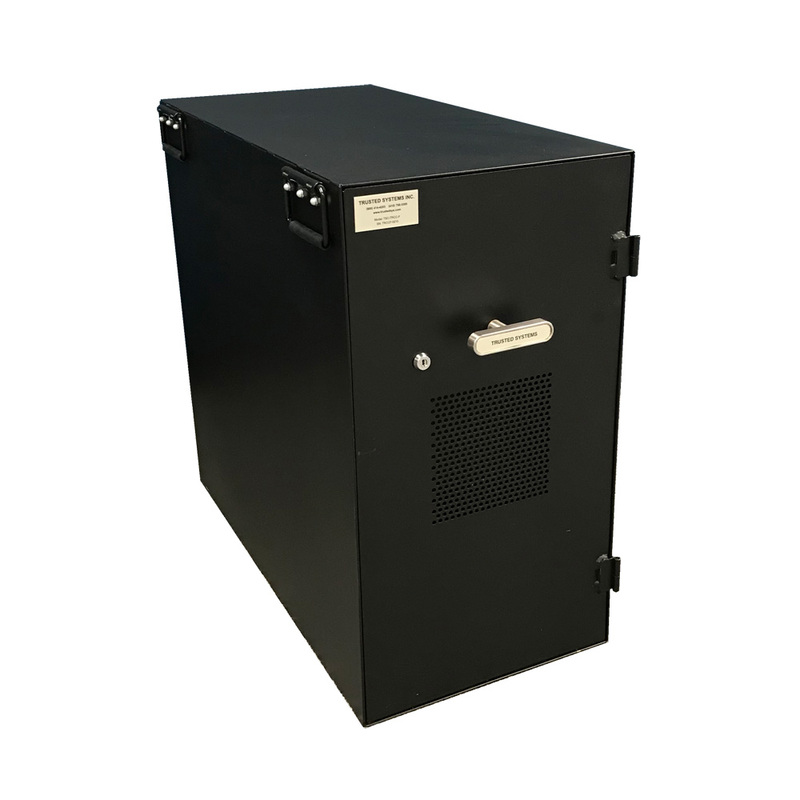 Among the standard features in a Secure Computer Cabinet are a built-in, thermostat-controlled cooling system, onboard power strip, secure cable ports, and a 2-year warranty to ensure trouble-free, closed-door operation. 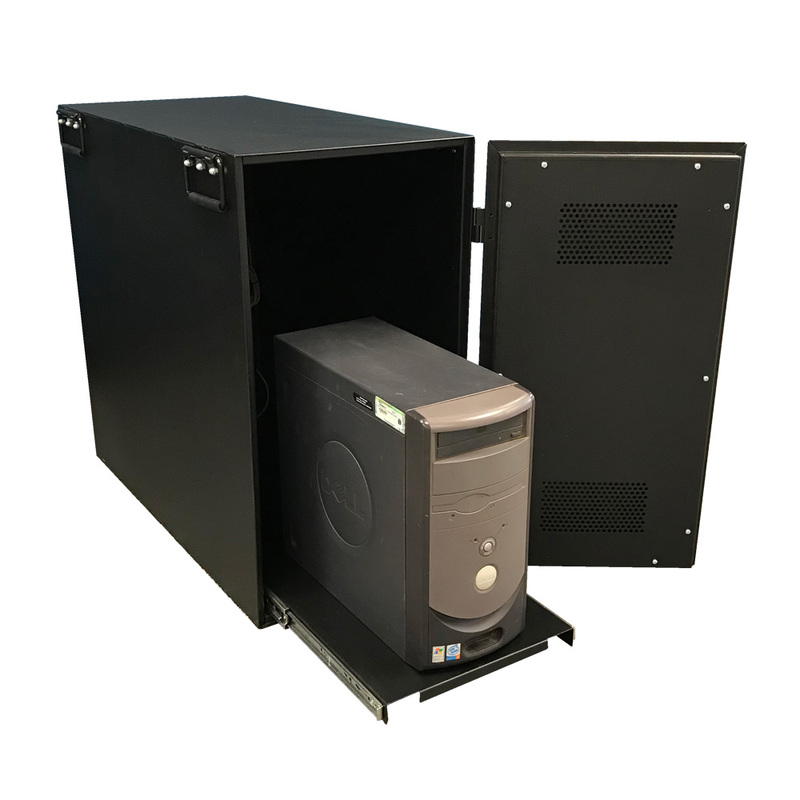 Trusted Systems Secure Computer Cabinets are perfect for added security within government/contractor SCIF environments where a GSA class 5 IPS container is not required. Welded construction means there are no seams that expose pry points. No exposed rivets or screws that can be easily drilled or chiseled out. No line-of-sight openings to the internal components. Secure cable-feed ports prevent direct access to internal devices. High-security door mechanism locks all four sides with non-visible steel bars preventing access even if hinges are compromised. High-security Assa Abloy pick-proof cam lock prevents master-keying. Standard, built-in thermostatically-controlled cooling maintains a controlled internal operating environment. Standard, side-mounted, 5-port power strip assists cable management, minimizing external leads. Standard slideout tray with mounting options for rack-mounted devices. The Secure Computer Cabinet, by Trusted Systems.